Wireless presenter with laser pointer offers 2.4 GHz wireless technology that delivers 65' of free roaming. Compact design uses hidden dongle as on/off switch. Bright laser beam provides easy-to-see pointer visibility. Wireless USB receiver stores inside palm-sized controller. Ergonomic design fits comfortably into the palm. Fingertip control delivers easy operation. Plug and play simplicity requires no setup. 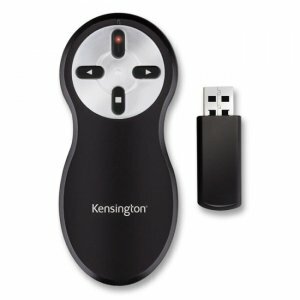 Wireless presenter uses two AAA batteries for long, reliable usage (included).